Tea Party Boise appears to be keeping its promise to sustain its efforts on behalf of conservative policies in 2010. The January events include an inaugural annual meeting and a Statehouse rally with other Tea Party groups. Tea Party Boise also is surveying its members for direction on the group’s future. “The fight begins now, so stay tuned, stay involved with us,” says an unsigned e-mail to Tea Party Boise members last week. The survey asks members whether the group should remain nonpartisan, encourage conservatives to run for office, publish evaluations of candidate records, and collaborate with the national Tea Party movement. It also asks about policy issues, including term limits and earmarks, and whether members would support “nullification” legislation seeking to empower Idaho to oppose any federal law that violates the U.S. Constitution. Yes, that nullification idea is a sure winner. Too bad John C. Calhoun isn’t around to help you draft that legislation. The Boise rally drew 2,500 protesters to Capitol Park, Boise police said. The group used the rally to build membership. Tea Party Boise publishes an electronic newsletter and operates a Web site. Actually, the “Tea Bag” movement is the biggest hoax in history. The so-called “grassroots”, populist uprising is as “astro turf” as you can get. According to TPMMuckraker, most of the money contributed by the gullible public who gave to the Tea Party PAC went to the GOP public relations firm that created it. 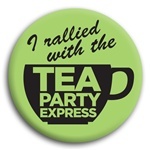 The political action committee behind the Tea Party Express (TPE) — which already has been slammed as inauthentic and corporate-controlled by rival factions in the Tea Party movement — directed almost two thirds of its spending during a recent reporting period back to the Republican consulting firm that created the PAC in the first place. Our Country Deserves Better (OCDB) spent around $1.33 million from July through November, according to FEC filings examined by TPMmuckraker. Of that sum, a total of $857,122 went to Sacramento-based GOP political consulting firm Russo, Marsh, and Associates, or people associated with it.